Lord Jasper, younger son of a marquess, suffered horrible burns fighting in the Napoleonic Wars. He wears a mask to hide his face from the stares and screams and finds comfort in the shadows. Jasper is an exceptional bounty hunter, so when a woman summons him to her deathbed and asks him to find her runaway daughter before she passes away, he doesn't refuse. Jasper is close to his quarry when he's knifed by an assailant. Imagine his surprise when he regains consciousness in the arms of the woman he seeks. Except she's not at all what he expected. I've enjoyed all of the books in Galen's The Survivors series but Jasper and Olivia's story is my favorite. They both carry deep emotional trauma that has led them to hide from others. For Olivia, it meant running away from everything and everyone she knew while Jasper hides his burns beneath a silk mask and his emotional vulnerability even deeper. I liked that the first half of the book takes place in Olivia's secluded cliff-side cottage with the only human interaction between Jasper, Olivia, and her five-year-old son, Richard. It gives this wary couple the necessary time and seclusion to let down their guards enough to become friends, and possibly more, before they have to face the challenges that await in London. I admired Olivia's strength, the tough decisions she made to protect her son and herself, her determination to take back control of her life once the decision to finally confront her attacker is made, and to fight for both happiness and love. I appreciated Jasper's patience and care in light of Olivia's fears, his gentleness with both her and Richard, and his determination to protect them at any cost to himself. These three belong together and I was cheering them on the entire way. Speaking of Richard, I love that kid! He's an energetic, inquisitive, scene-stealing, heart-grabbing sweetheart. Many of his scenes are infused with humor (he is a five-year-old boy, after all) but there are some between Richard and Jasper that are so tender and poignant I was almost brought to tears. Theirs is a love story of a different kind and it captured my heart just as surely as the love between Jasper and Olivia. There are nine more books planned for Shana Galen's The Survivors series. Based on the quality of the first four, I need to make more room on my keeper shelves! I recently had the opportunity to interview Shana Galen. I hope you enjoy our Q&A below. Don't miss the giveaway at the end! Welcome to The Romance Dish, Shana! 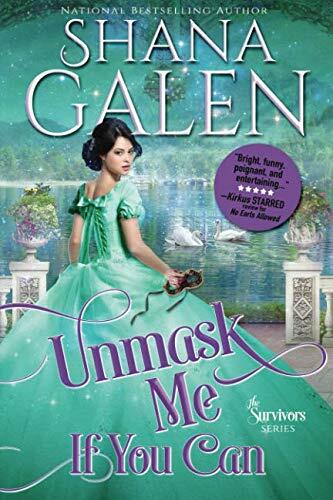 Unmask Me If You Can is your fourth Survivors story. How many more books are planned for this series? Initially, I’d planned 12 books, but then I realized I had to write a book for Benedict, the leader of the troop. So there are 13 planned now—9 to go! What can you share about the next book and when do you expect it to be published? The next book is about Benedict Draven, the leader of the Survivors (aka Draven’s Dozen). At the start of the war, he saved a young woman by marrying her in a Catholic ceremony he considers completely illegal. He didn’t expect to ever see her again. The Claiming of the Shrew is what happens when Catarina shows up in London after the war, wanting an annulment so she can marry another man. It will be out in April 2019. 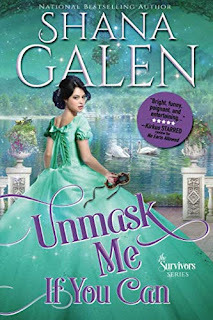 I'm already eagerly anticipating Draven and Catarina's story based on their brief interaction in Unmask Me if you Can! I have loved the characters in this series. Will we have an opportunity to catch up with any/all of the couples before the series comes to an end? That’s going to be a lot of couples! I don’t know that I could do that in a book and still have it focus on the main characters. Maybe I’ll do an epilogue like I did for the Jewels of the Ton series. A series epilogue! I like that idea! My favorite scenes to write were those with Jasper and Richard, the heroine’s 5-year-old son. Jasper wears a mask and avoids kids, who are generally afraid of him. He doesn’t know what to do with this kid, who thinks scars are cool and asks all those questions we adults aren’t quite sure how to answer. The most difficult to write were the intimate scenes with Jasper and Olivia. They’ve both faced so much trauma, and I really wanted to respect that and also show that love can overcome anything. I thought you did an outstanding job of crafting the intimate scenes between Jasper and Olivia with great care. And the scenes between Jasper and Richard were some of my favorites in the book. I’m currently enjoying the crisp, clear days, cool nights, and hearty soups and stews of fall, not to mention the football. I love football! What’s your favorite season? What makes it so? Is there a favorite food or activity that reminds you of it? My favorite season is spring. I love the warm (but not too warm) weather, the flowers blooming, the baby animals, and dining al fresco. I always feel like it’s really spring when all the St. Patrick’s Day activities kick off. My daughter does Irish dancing, so we do a lot of parades and shows around St. Pat’s. Let's do a fast five! Thanks so much for visiting with us, Shana. Do you have anything else to add? Would you like to ask my readers a question? Love her stories. Maybe yellow or lilac. Oh, I can't wait to read this. I've read so many of Shana's books and loved them. What about a beautiful shade of either purple, lavender, or royal blue for the cover dress? The dress color should be sky blue. Love the delightful novels. Thanks! That's my daughter's favorite color. Coral is so soft and pretty. What a gorgeous cover. Hi Everyone! Sorry, I'm getting a late start this morning. Welcome, Shana! I would say yellow or coral, but only if it goes with the character's complexion. I think either would go. She has a dark hair and a darker complexion. I like dresses in bold gemstone colors like red, royal blue, or emerald on the covers. Love your books Shana! Red or violet would be nice. Based on the colors previously used, I suggest a soft yellow. I've been thinking about that one a lot. If you want another pastel color, I suggest yellow. If you want to be a bit bolder, you could choose a golden color. I think bold might be better. I love your books! This is the next series on my list to read. I wouldn't mind a yellow or lavender. I think both would be so pretty. Now I am hungry for mashed potatoes. I watched Ree Drummond mash 10 pounds with 4 sticks of butter and 16 oz. Of cream cheese. Split it between 2 casserole dishes. My arteries clogged just reading this. Maybe a daring colour like red? I think rd would be perfect, but I have a lot of red coming in 2019. Maybe orange? Those are my favorite colors. I have had the pleasure of reading this book. I loved the book. I especially loved Richard and yes, when Jasper is being the man he truly is with Richard it makes your heart smile. How about going with a lavender color dress. I've enjoyed the books of Shana's that I've read. PJ, great review and interview with Shana. Since red is my favourite colour I'll say red. You ar going to like the covers for my next 3 books then! Royal blue is my favorite. I love this series but I haven't read this one. My royal blue covers are some of my favorites. Hi! Love this book! Such energy and deep emotion. A great addition to a great series! I'd love a catch up epilogue at the end. And a deep purple for Catarina. I am more than intrigued about this spitfire and a man always in control, Draven! Hmmm...what would you like to know in an epilogue?